The new A Muse Studio Holiday mini catalog is full of stamps, die cuts and accessories for Fall, Halloween, Winter and Christmas. 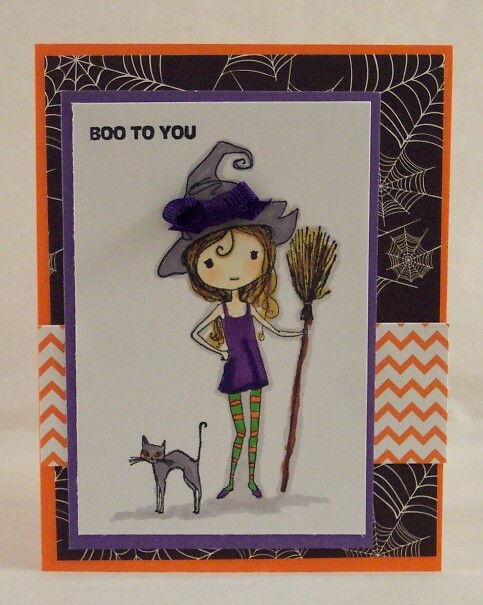 Inside you’ll find cling mounted rubber stamps and coordinating die cuts of cute kids dressed up for trick or treat, Halloween party invites, spooky image for candy bags, party decor and treat labels along with Halloween pattern treat bags, twine, sequins and buttons. There’s also stamps and dies of cute villages, festive wreaths, adorable snowmen, words, phrases and images perfect for holiday cards and gift tags with buttons, bags, sequins, twine, foil cardstock, gold bags and new ink sprays all in Holiday colors. 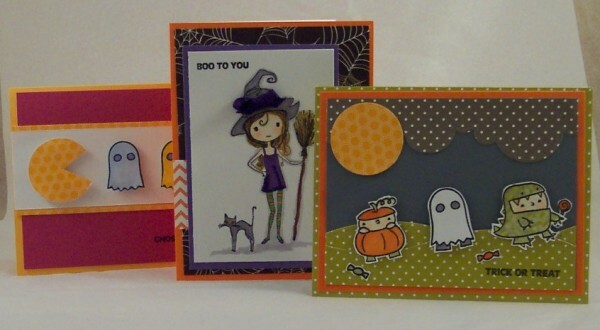 I was so happy to try some of the new products and make some samples using some of the new Halloween products. For my first card I used the witch girl (isn’t she cute?) and cat from the new Spooky Girlfriend stamp set, coloring her with markers and adding a ribbon bow to her hat. The words are from the Ghostly Greetings set, the web pattern paper is from the Mysterious Manor paper pack, along with orange chevron cardstock, all of which are available in the regular A Muse catalog. 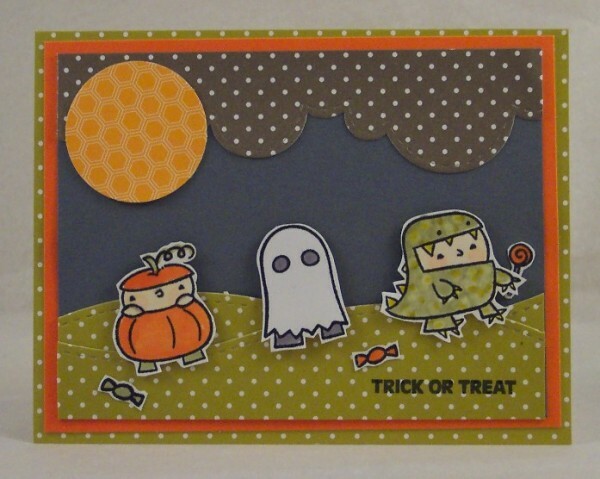 Next I made this fun Trick or Treat scene using some of the kids from the new Costume Parade stamp set, leaving a trail of candy behind like kids tend to do 🙂 . The words and candy are from the Ghostly Greetings set. I used petite polka dot pattern cardstocks with the Landscape die set for the hills and clouds, which are from the regular catalog. For my last card I wanted to have some fun and use some Halloween stamps for a non Halloween card. 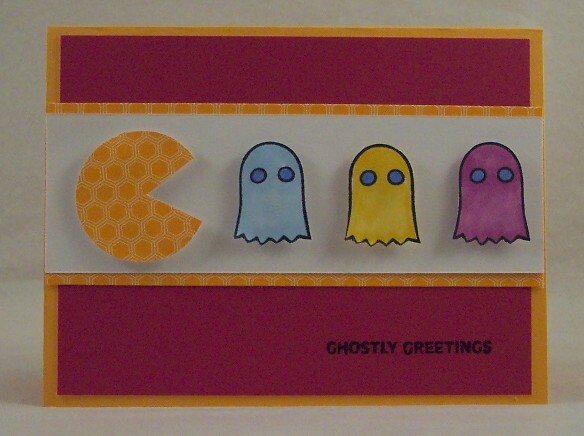 I made this Pacman video game inspired card using the ghosts from the Costume Parade set (cutting off their legs when I cut them out). The words are from the Ghostly Greetings set. For Pacman I punched a circle from some yellow Hexagon cardstock and cut out a wedge for his mouth. This would be such a cute birthday card for someone who loves to play video games and is a great way to get more use from your Halloween stamps! All these new items are available now, click here to visit the A Muse website to shop on-line or find a consultant near you to place an order or host a home party. I hope you’ve enjoyed this look at some of the new items from A Muse Studio, check back soon for more Halloween and also Christmas and winter inspiration coming from me soon. I love all of your cards!! Very cute idea for the Pac-man card! Wow! Spooky girlfriend is gorgeous and not scary at all. All cute cards!